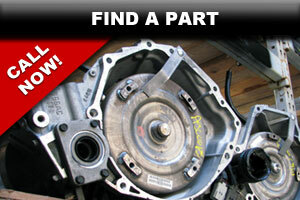 Searching for Used Auto Parts for Your Car, Truck, Van or SUV in NC? Matlock's Used Parts of Hickory-Claremont & Cleveland, NC has over 240,000 square feet of warehouse space and over 80 acres of auto salvage & recycling facilities. Call now to locate local auto parts instantly! Local Salvage Yard Locations in Hickory-Claremont & Cleveland NC. With two convenient salvage yard and parts sales locations locally serving all of NC, parts of SC and VA, your replacement parts are just down the road and a quick phone call away. Call or visit us today! 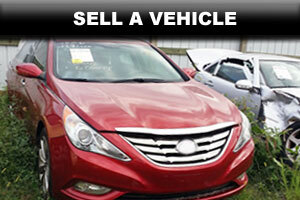 Sell a Wrecked, Salvage or Junk Car in the Hickory, Statesville or Cleveland NC areas? Matlock's pays among the top prices in NC for all types of vehicles to part out and recycle. We dismantle and sell only the best parts and then crush the rest as scrap metal. With multiple large auto salvage yards in NC, Matlock’s Used Parts is considered to be one of NC’s largest auto recyclers. And with a history dating back to 1946 they are also one of the oldest local and national used auto parts providers. Matlock’s vast warehouse storage space of over 240,000 square feet makes it virtually an indoor auto salvage yard! Call or visit one of our NC salvage yards today! Searching for the best local used engines, transmissions, mechanical parts or auto body parts for your car, truck, van or SUV? Matlock’s maintains one of the largest in-stock inventories of car and truck engines, transmissions, mechanical parts as well as body parts, used tires, wheels and more. 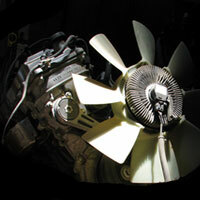 Call Matlock’s today to locate the best used parts for your vehicle! Matlock’s takes great pride in offering only the best quality used auto parts and auto recycling services! 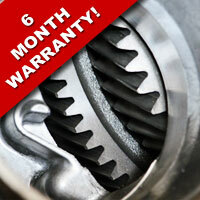 We offer a worry free Six(6) Month Warranty on all in-stock used parts. To further protect your used auto parts purchase, we also offer an extended warranty program that includes coverage for labor cost. Call for complete details and availability for your parts purchase. 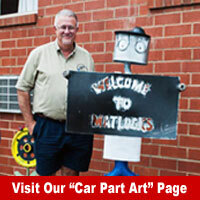 Matlock’s Used Parts has been a family owned and operated auto recycler since 1946! We have one of the most trusted names in the local used auto parts industry and our dedication to quality used parts as well as excellent customer service is reflected in every part that we sell. 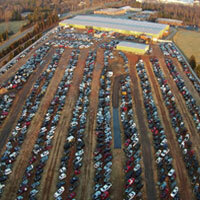 Please visit one of our 2 salvage yards in North Carolina and experience for yourself the Matlock Loyalty! Matlock's is a full service used auto parts and auto recycling company serving NC, SC, VA and the entire US via nationwide shipping including: Hickory, Charlotte, Greensboro, Statesville, Winston Salem, Asheboro, Asheville, Cleveland, Claremont, Taylorsville, Salisbury, Mooresville, Kanapolis, Concord, China Grove, Lincolnton, Gastonia, Huntersville, Cornelius, Denver, Lexington, Mocksville, North Wilkesboro, Clemmons, High Point, Mt. Airy, Elkin, Yadkinville, Siler City, Cherryville, Morganton in NC, Martinsville, Danville in VA. We stock thousands of used parts for most makes, models both foreign and domestic including: Engines, Transmissions, Axles, Rear Ends, Starters, Alternators, A/C Compressors, Radiators, A/C Condensers, Cooling Fans, Transfer Cases, Wheels, Tires, Auto Body Parts including: Front Ends, Hoods, Fenders, Grilles, Front Bumpers, Headlights, Fog Lamps, Turn Lights, Doors, Body Panels, Taillights, Rear Bumpers, Deck Lids, Quarter Panels, Interior Parts and almost any used part on a salvage vehicle. We also buy local wrecked, salvage & junk cars for recycling. 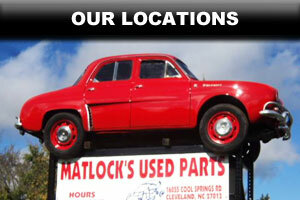 Matlock's Used Auto Parts in Hickory-Claremont & Cleveland NC.